Freethiel Stadion is a multi-purpose sports arena located in the municipality of Beveren in the province of East Flanders. 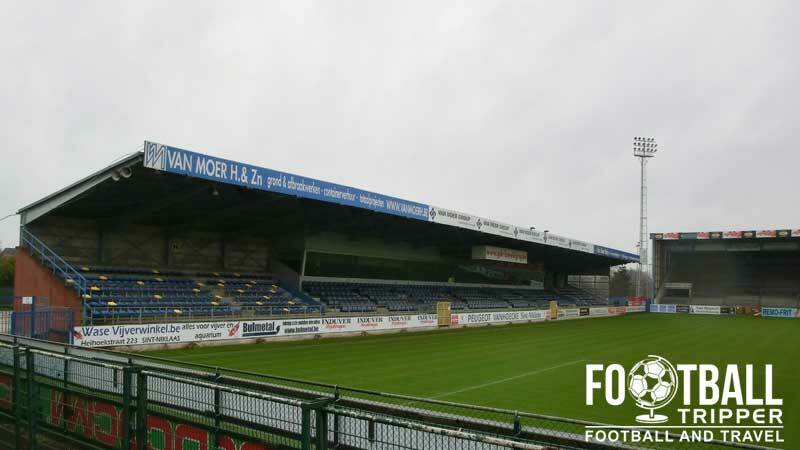 Used the majority of the time for football matches of the Belgian Pro League, the 13,290 capacity stadium is home to local side Waasland-Beveren and was last renovated in 2008. Freethiel Stadion is named after Frederik Thielemans who generously allowed Waasland-Beveren to play football at the location of his cycling-track during the club’s formative years. The club made Freethiel Stadion their home by welcoming Belgium team Ronse for a friendly match on July 31st 1938 with the players pleased to have a dedicated playing surface regardless of the quality. With the break out of War across Europe between 1939 – 1945 football was cast to one side, and developments to the stadion were minor with the first concrete stand only erected on the 21st of August, four years after the end of World War 2 in 1949. Up to this point, stands were either fastened out of low quality timber or compiled from surrounding banks of dirt. 1967 was the earliest opportunity that Waasland-Beveren could afford to do build proper stands, with the transition to “first class” stadium made by completely rebuilding all four stands and facilities including press offices and changing rooms. Set at an initial capacity of 16,350, the club expanded two years later in 1972 and again in 1974 to raise the capacity to a decent 22,000. With the failure of Freethiel to be involved with Euro 2000, it could no longer be regarded as a decent European Stadium, with the title seemingly lost in the 1990s when it began to lag behind other Belgian stadiums. 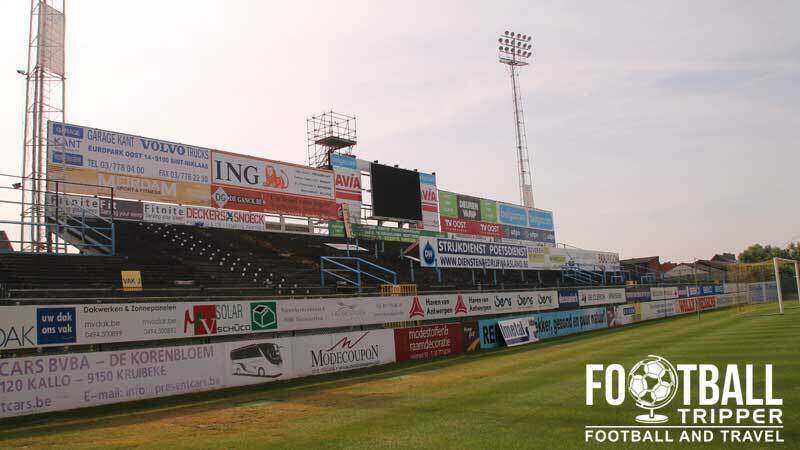 Waasland-Beveren filed planning permission in 2005 and three years later completed the rebuilt of the main grand stand to help modernise facilities. As of 2009 the club have expressed a desire to rebuild the remaining three stands but capital hasn’t exactly been forthcoming. Freethiel Stadion is comprised of four stands: North, East, South and West. Away fans are housed within one half of the western goal-end which is shared with home supporters. Visiting supporters or “Bezoekers” occupy the northernmost side of this short side stand, with tickets costing a flat price of € 20.00. 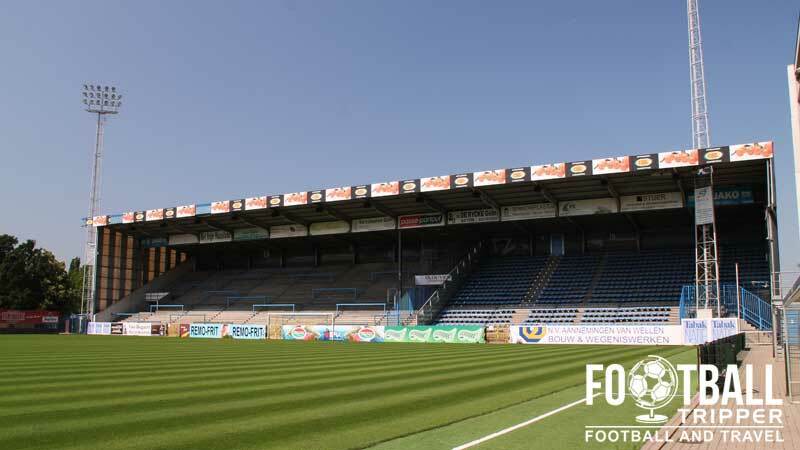 Waasland Beveren operate a club shop at Freethiel Stadion which is supplemented by the club’s official online store which allows you to browse all of the official merchandise in advance of your trip. On Saturday matchdays the club shop remains open until 8.00 pm, and for other games it is usually open for at least a few hours before kick-off. There aren’t any official tours of Freethiel Stadion currently available to the general public. Take in a match there instead to see the ground in all its glory. 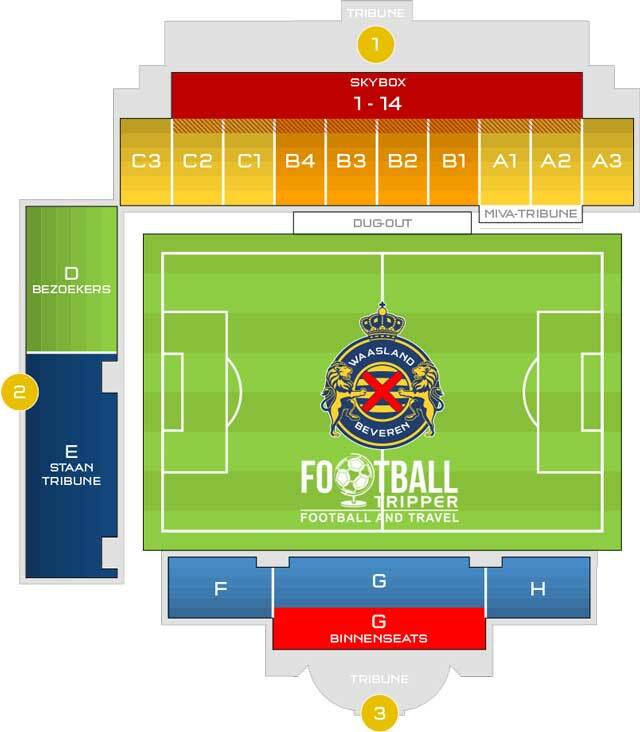 Tickets to see Waasland Beveren play at Freethiel Stadion can either be purchased online or from the club’s offices/fan shop during the aforementioned opening hours during the week leading up to the match. Please note that the above prices reflect tickets purchased for matches during the regular season only. Play-off matches and cup games for example maybe priced differently. 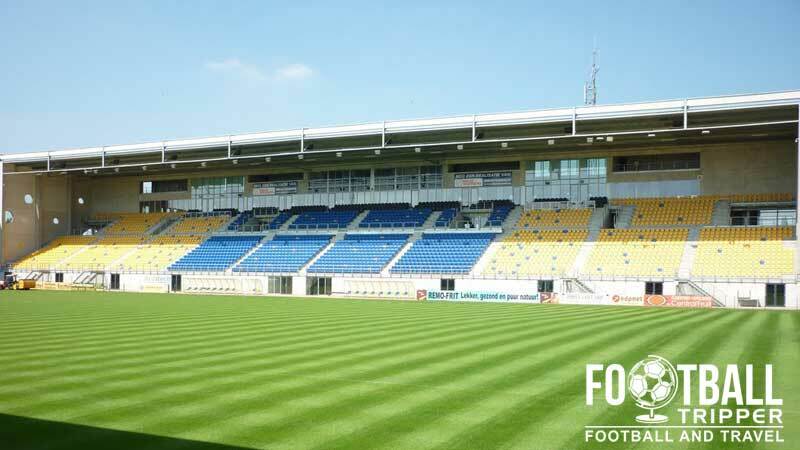 Freethiel Stadium is located 15 minutes west of Beveren’s city centre and around 25 minutes from the station at a distance of around 1.5 km. There are over 9 car parks in total at Freethiel Stadium however a good number of them are reserved for various departments of the club which means you should follow any instruction/signage once you get to the ground. There is a decent map of the parking at Waasland’s ground available here (just scroll down). Beveren Railway Station sits on rail line 59 which is one of the stops on the Antwerp-Ghent-Ostend Route. There is also an hourly service in the other direction to the city of Lokeren. Less than a few hundred metres North of the ground on Klapperstraat there is the Beveren Vinkendam bus station which is served by the number 83. The closest major airport is undoubtedly Antwerp International which is 21 km east of the small commune of Beveren. Second to this in distance is Brussels Airport which is almost twice as far away at a distance of 56 km. Beveren lacks an extensive range of accommodation options which means you may wish to look further afield within Antwerp itself. The two closest options B&B Euverbraeke and Hotel Beveren are both four stars and aren’t exactly in walking distance of the Waasland’s stadium.